A seemingly small change to the service that passengers can expect to receive while flying with the Dubai-based mega airline, Emirates is causing a big ruckus amongst the airline’s cabin crew. The changes which go into effect today are said to have been implemented following a successful trial on a limited number of routes, according to an internal memo that we’ve seen. The changes are focused on a small number of alcoholic drink options that passengers can choose from in the Economy cabin, with full-sized bottles of wine replacing the individual mini quarter-sized bottles that passengers have been given in the past. Mockups of how trolley tops are to be set up seem to suggest that there will be two white wine options and only one red wine option. Emirates has told its cabin crew that the changes should have a positive impact on both passengers and crew. Explaining the benefits, the airline says it will be quicker to prepare a service trolley, quicker to clear waste and of course, there will be less waste than handing out individual bottles. The airline says, one full-sized bottle of wine is good for six servings. Popular soda’s like Pepsi cola will also be served from a full-sized bottle rather than being given out in individual cans. 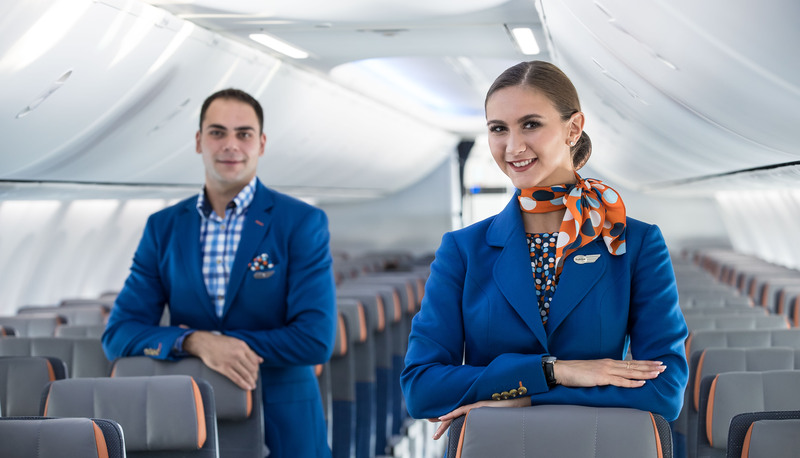 Other changes will see a separate drinks cart being abandoned on certain routes – instead, cabin crew will serve a meal and drink at the same time and from the same trolley. This should be a positive change as passengers will be served a meal and a drink at the same time but they should be prepared for less choice to be available. A mockup of how Emirates’ economy trolley tops will now be set up. Cabin crew at the airline, however, haven’t entirely been won over with the changes. Some have said the service will be slower and passengers will be disappointed with the new offering. Crew who have worked on the trial, say the changes did not result in the benefits advertised by management. While the service changes do seem a little surprising, it’s worth noting that Emirates certainly isn’t alone. Neighbouring Etihad Airways has offered a similar service for many years and other carriers including Lufthansa and Air France also pour wine and soda by the glass. Other changes to the Business Class service are also expected to be introduced soon in an effort to reduce the overall time the service takes. For now, however, Emirates is focusing on a small number of changes surrounding the delivery of table settings and main meals. Passengers are unlikely to see much of a difference at the moment. Yesterday, Reuters reported that Emirates would start to offer a Premium Economy product from 2020. The news was confirmed by the airline’s president, Sir Tim Clark in a podcast that is broadcast on all Emirates flights. The new seats will be installed on to 20 Airbus A380’s aircraft which the airline ordered earlier this year (and in effect saved the A380 project). There’s still no news on whether Premium Economy will be retrofitted into the airline’s existing fleet of Boeing 777’s and A380’s or if the product will be launched on Emirates’ yet to be delivered Boeing 787’s and 777X aircraft. The first of 40 Dreamliner’s will be delivered in 2022 and the airline also has 150 next-generation 777X aircraft on order. Emirates and Sir Tim Clark have been very wary of Premium Economy in the past, fearing that such a cabin would cannibalise its Business Class cabin. Sir Tim has claimed the new cabin will be very “special”, saying the airline has been working on the product for several years.